The kids went to sleep (finally!) so I opened my laptop. Ok work mode. Went to get a drink from the kitchen. Came back and sat down to really focus and dig in. I had so many emails starred that I was planning to settle all of them tonight. Suddenly I saw movements from Mariam’s cot. 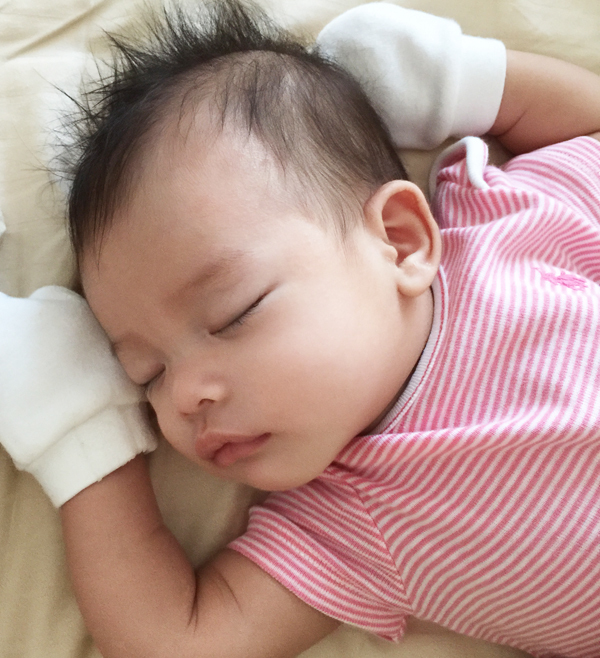 Go back to sleep, go back to sleep, go back to sleep… I was sending telepathic messages to my daughter. I mean, as a mom, I must have some sort of psychic bond with my child no? Ekk…ekkk… Mariam started making soft sounds. Go back to sleep, go back to sleep, go back to sleep… I thought faster and harder. This telepathy thing isn’t working!! And there she went… all out with the crying. Waaaaaa… waaaaa! Sigh. I walked over to her cot, determined not to pick her up and give in. I need to start training this one early that she can’t expect to be picked up at every sound she makes. I read it somewhere, I swear I am not making this up like a mean mom. Finally she opened her eyes, looked at me and started to make a crying face. I felt like it was a big negotiation, but I was very tired so I’ll do anything. If offering to buy her nice shoes can help her fall back to sleep, heck, I’d do it! Mariam stared at me with her eyes big and round. “Mariam good girl, right? Mariam let Mommy do some work, ok? After this, Mommy will hug you to sleep yeah, baby?” I smiled at her. Like a miracle just happening before me, she smiled back. AND WENT BACK TO SLEEP!!! I stood there, in disbelief. Omg I knew it. I have magical powers. I can talk to babies. I was so excited I couldn’t wait to tell Dean, but he was in the shower. I looked around to see who else I could brag and gloat to, but everyone else was asleep. Dangg!!! Why is no one here to witness the awesomeness that just happened? I literally talked Mariam into going back to sleep. That’s pretty news worthy, guys. Dean came out shortly after. Ugh, whyyyy… Whyyyy didn’t I install cameras in my living room. urgh… so cute.. Mariam is a good baby. She listen to mummy. Oh Vivy, please help me to convince me to buy your dUCkscarves. I like to wear wide shawl until I custom made my shawl to fulfill my shawl size requirement. But your dUCkscarves is so cray..cray..one…haha.. Anyway, Good Nite Vivy, Good Luck with your current project..
erm…how do you get traffic on your blog without mentioning it on ig?! what is this sorcery haha. you must’ve loyal fans and i guess i just became one of em! Alhamdulillah…Mariam is so pretty and you are so blessed Vivy! In shaa Allah. I hope you will share Mariam’s Cukur Jambul photographs. I had been waiting for it. Salam vivy yusof. Vivy, saya nak minta tips awak untuk study boleh? I will have my final exam about one month from now. tapi…….dalam seminggu ni carry mark untuk subjek is out n mine is so bad for almost all subject. I feel very bad and now I lost my focus and encouragement to study for my final. Maybe you might just bore her to sleep? Heheheheh…kidding vivy..your such an inspiration..love reading your blog. Your daughter Mariam, she’s just beautiful 🙂 And I am amaze with the photo !